All joking aside, April 15th, or Tax Day, is here. And for many, tax season is not a tedious burden — but as welcome as those first tulip blooms of the year. Each year during tax season, roughly 25 million Americans claim the federal Earned Income Tax Credit (EITC), a refundable credit designed to offset income or payroll taxes for low- and moderate- income workers. Taxpayers who earn $55,000 or less are eligible for the EITC, and the credit serves to reward and encourage work as its size grows along with the income a recipient earns throughout the year. Research shows EITC recipients use the credit to pay for things like rent, reliable transportation to work and groceries. The impact of this anti-poverty, pro-work tool in communities accross the nation has been incredible. In 2016, the EITC lifted close to 6 million people out of poverty and reduced the severity of poverty for almost 19 million people. What’s more, the credit is linked to improved health and educational outcomes, lower rates of criminal recidivism and even longer life expectancy. But the EITC still has room for improvement. Right now, the credit largely excludes workers who aren’t raising children at home: the lone group taxed into poverty by our federal tax code. For these taxpayers, including non-custodial parents, the size of the EITC is dramatically smaller than for families with dependent children – maxing out at about $500 – and doesn’t provide the same stabilizing effects. Workers who are below the age of 25 or above the age of 65 and aren’t raising dependent children are excluded from claiming the credit entirely. Lawmakers can build on the EITC’s success by increasing the maximum credit for workers not raising children at home and extending the age limits. These improvements would benefit approximately 13 million hard-working individuals, helping to build a more inclusive economy and making tax time more rewarding for more of our fellow Americans. 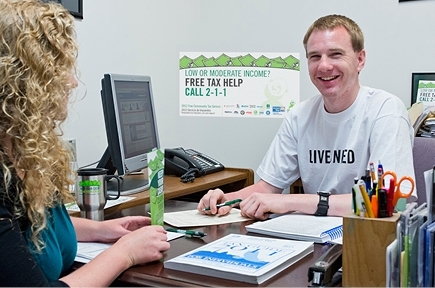 To learn more about how lawmakers can improve the EITC, visit United Way Worldwide’s call to action here and Tax Credits for Workers and Their Families website here. Lauren Pescatore is a Vice President at The Hatcher Group and the Director of Tax Credits for Workers and Their Families (TCWF), a non-partisan communications initiative working to promote tax credits for low-wage workers. Lauren works with policymakers and advocates at both the state and federal levels to develop communications strategies and materials that help raise awareness of and build support for the Earned Income Tax Credit, Child Tax Credit and Child and Dependent Care Credit. Caitlin Arenas Martinez is a Director of Public Policy and Advocacy at United Way Worldwide, where she advocates for financial stability public policies. In addition to supporting a robust grassroots advocacy campaign, she helps to build the capacity of local and state United Ways to engage in advocacy.